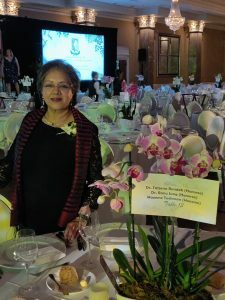 Dr. Ranu Jung has been selected as a 2019 In the Company of Women awardee in the category of Science & Technology. She is among 15 winners to be honored at the awards ceremony dinner on March 7, at the Coral Gables Country Club. Dr. Jung is the WH Coulter Eminent Scholar Endowed Professor and Chair, Department of Biomedical Engineering, at Florida International University. A leader in developing neuro-technology for recovery and restoration of lost neural function after trauma, she has led her team in developing the first wirelessly-controlled, implantable, nerve stimulation system for restoring sensations to amputees. The investigational device system has been approved by the Food & Drug Administration (FDA) and is undergoing a first, in-human clinical trial. The holder of eight U.S. patents, and founder of a research and development company, Dr. Jung is a Fellow of the National Academy of Inventors, Fellow of the American Institute for Medical and Biological Engineering, and elected member of the International Women’s Forum. The event commemorates March’s Women’s History Month and International Women’s Day, and it will be extra special this year, as it is a signature celebration for the Parks Department’s 90th anniversary. Proceeds support The Women’s Park and the Girls Empowerment and Mentoring (G.E.M.) Summer Arts Program.